TAPLOW, England - Novelist H.G. Wells dreamed of time travel a century ago in London, and the Cliveden Hotel, just outside the great city, can take you on a journey back to that bygone era. Destination Hotels and Resorts, which owns the Cliveden, has brought it up do date by purchasing nearby Lambourne Club, with its 18-hole championship golf course, to make it a truly full-service resort. "When you have a hotel of this stature, you have to offer people everything," said Debbie Hunter, public relations executive at the Cliveden, the only grade-one, five-star hotel in the United Kingdom. "If people are going to pay the money, they want all the options, and golf is a necessary part of the package." "When people come to London, they want the history, the theater, the shopping and the restaurants, but many of them also want the spa treatments, sporting activities and the service. They are buying the experience." 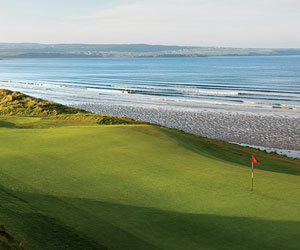 "We needed the golf in order to keep up with what other resorts have to offer." The Cliveden, which was built in 1666 by the second Duke of Buckingham, is a chapter of British history by itself. Three Dukes, a Prince of Wales, an Earl and the storied Astor family have lived on the 376-acre estate. Nancy Langhorne Astor, an American and lady of the manor in the early 1900s, became the first woman elected to Parliament. Queen Victoria visited the Cliveden nine times and the Queen Mother, who died in April 2002 at the age of 101, also was a frequent guest. The Cliveden, 35 minutes from downtown London and 20 minutes from Heathrow Airport, has two exquisite sister properties in England - the Cliveden Town House in the Chelsea district of London, and the Royal Crescent Hotel in Bath, which is another slice of British history. Despite a legacy that covers parts of five centuries, the Cliveden is perhaps best-known for an incident, shall we say affair, that took place only 40 years ago and eventually led to the fall of the Conservative British government. John Profumo, British War Minister and next in line to be Prime Minister, rekindled an old romantic relationship when he saw call girl Christine Keeler at the Cliveden's swimming pool. Many of their liaisons took place at the Cliveden's Spring Cottage, located in an idyllic spot on the Thames River. What Profumo did not know was that Keeler also was involved with a Soviet military attache, and this was the early stages of the Cold War. When the scandal broke in 1963, Profumo resigned in disgrace and his friend, wealthy businessman Stephen Ward, who played the role of Cupid in the affair, committed suicide. Mandy Rice-Davies, a colleague of Keeler and companion of Ward, wrote her memoirs and became rich and famous. More conventional activities at the Cliveden including boating on the Thames, squash, bicycling, horseback riding, tennis, fishing, shooting, archery, and now golf. Lambourne, five minutes from the Cliveden, is a picturesque 6,771-yard parkland course designed by Donald Steele, chief architect for the Royal and Ancient Golf Club of St. Andrews, that opened in 1992. The course is set on 190 acres of rolling terrain with mature trees and six lakes coming into play. "We announced plans to renovate the course and the clubhouse, but the members didn't want that," said Brian Sparks, general manager at Lambourne, who came from the famed Le Bordes Club in France. "They were up in arms. They like the course the way it is. So our long-term goal is to just bring the quality of the product and the service up to the level of the Cliveden Hotel." "This is not Le Bordes, but that is not necessarily what the Cliveden is looking for. This is a course our guests will enjoy playing. We could create a difficult course but that's not the type of golf experience you want at a resort. We will do some work on the bunkers and probably make a few other subtle changes, tweaks to the course." Sparks would like to convert the 542-yard 14th hole, which greets guests at the front gate because the tee shot carries across the entry road, from a par five to a par four. Eliminating the tee shot across the road would make it a tremendous second-shot hole. Four bunkers protect the front of the green, making it difficult to run the ball onto the putting surface. He might have to fight the members, but Sparks thinks it would make a big difference. "That hole has a great, sweeping golf look to it," Sparks said. "It's a good par five but not a great one and I think it could be a great par four. That would make for a long, demanding second shot. I think it might become the best hole on the course." "We could lengthen another hole to keep the par at 72, but what's wrong with a par 71? Some of the best courses don't have a par of 72." There are seven par fours at Lambourne that play more than 400 yards, including the 448-yard sixth, the 446-yard eighth and the 438-yard 11th, but not to worry. Like most courses in the U.K., Lambourne plays hard and fast. American guests hit some of their longest drives in the British Isles, shortening those long par fours and bringing eagle or birdie into play on the par fives. This is a slightly different game, one the likes of Scott Hoch will never appreciate. But learn to play the bump and run, plus the Texas Wedge, and become a fan as did Tom Watson, who wasn't initially enamored with Old World golf but became a convert and won five British Opens. In fact, these shots and other assorted knockdowns are recommended because of the seemingly omnipresent wind. "Our courses aren't as manicured as those in the States," said David Hunt, director of golf at Lambourne. "You might say our courses are a little rough around the edges. But we maintain the greens and fairways the best we can with the weather we have." "We feel we have a very nice resort course that is playable for the majority of players who come here." Hunt's favorite is the 412-yard finishing hole, where the elevated tee shot from all the way back has to be accurate through a chute of trees. The fairway slopes up to an elevated green and short drives that are unable to climb the hill leave a long second shot. That second shot, perhaps with as much as a three iron or three wood, plays into the prevailing wind. "It's a very difficult finishing hole, requiring two demanding shots," Hunt said. "I like that tee shot through the trees. I think it's our best hole." Sparks' pick is the 400-yard 10th, not one of longest par fours, but challenging nevertheless. The fairway slopes to the right and the second shot must carry a large lake that also guards the approach to the fifth green. There is some bailout area on the right, but two bunkers also wait there and there are two more traps behind the green. "It's a sneaky hole," Sparks said. "It looks fairly simple but there is much more to it than meets the eye. Maybe I like it because my office overlooks it and I see it every day." "Everyone seems to go right on that hole whether they want to or not and for good reason. That's probably the smartest way to play it, but the really good player can take a chance and go straight at it." Another hazard at Lambourne is a large oak tree that must be negotiated in the fairway about 50 yards from the green on the 518-yard fourth hole. The approach is made even more dicey by a large lake to the left of the green. As with many courses in the U.K., the course is dissected by several creeks, which are not always visible from down the fairway, so buying a yardage guide at the clubhouse can be a smart investment. And the sand in Great Britain often contains small stones, which makes bunker play tricky, although sometimes a trap will spit out an errant shot that hits a rock. There is plenty of other quality golf in the area, most notably at Foxhills in Ottershaw, the famed Wentworth Club in Virginia Water and Stoke Park Club in Stoke Poges, where Sean Connery filmed the golf scenes in the James Bond movie "Goldfinger." There's plenty to do in between rounds of golf, with Windsor Castle, Royal Ascot Racecourse, the original Legoland, Hampton Court and Blenheim Palace, birthplace of Winston Churchill, all in the neighborhood. When it's time to eat, you can find the Feathers pub right outside the gate at Cliveden, or travel a few minutes to the Bel and Dragon pub in Cookham, the Chef Peking in Maidenhead, or Chequers Inn in Bourne End/Wooburn Green. Also worth the trip are the Waterside Inn and the Fat Duck in Bray. Of course, you can just stay at the Cliveden and enjoy its three award-winning restaurants the French Dining Room, the Cellar and Waldos, which is a Michelin starred restaurant. Obviously, there is plenty to do at the Cliveden, or you can just watch time stand still. Tom LaMarre has been a sportswriter and copy editor in California for parts of five decades, including 15 years with the Oakland Tribune and 22 with the Los Angeles Times. There are few courses in the world where every step feels like a dream. Royal County Down Golf Club in Northern Ireland -- which hosted the 2015 Dubai Duty Free Irish Open in May -- is one of these precious few courses. Kiel Christianson has more from Newcastle.